The Battlestar Galactica and the rest of the Colonial fleet are relentlessly pursued by Cylons. Thirty-three minutes after each Faster-than-light jump, the Cylons arrive again, trying to exterminate what’s left of Mankind. Will you be able to bring the Colonial fleet to safety? 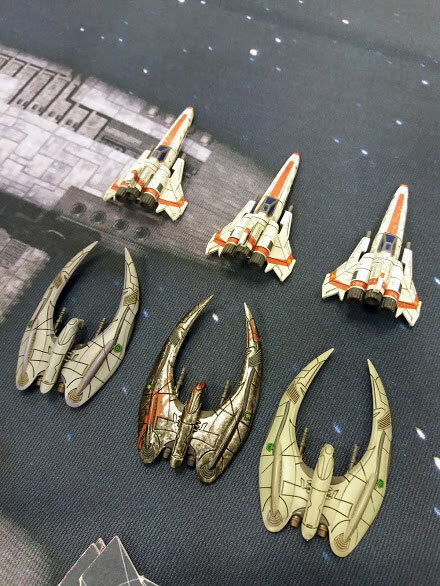 Battlestar Galactica Starship Battles - Vipers and Raiders will fight to protect or destroy the Colonial Fleet. Inspired by “33” - the first episode of the first season of the Reimagined series - Ares Games is launching an extraordinary series of massive events for Battlestar Galactica - Starship Battles, to be held at all major shows the company attends during 2019: UK Game Expo, Origins, Gencon, Essen, and Pax Unplugged. Each of these shows will be one of our “jumps” – the Colonial fleet is jumping from one event to the next, and the battle continues, involving hundreds of BSG fans around the world, starting Saturday, June 1st at 11 am at UK Game Expo in Birmingham, UK. During each show, the entire Ares Games booth will turn into a massive galactic battlefield, where up to 66 people – 33 on each side, Colonial and Cylon – will play Battlestar Galactica – Starship Battles at the same time. Will you defend the survivors of the 12 Colonies from destruction with your Vipers, or will you fight to destroy the Colonial fleet with your Raiders? All attendees of the shows are welcome to participate– no previous knowledge of the rules is required, as our demo crew will help new players to jump in the battle in a few minutes and spaceships to play with will be provided by Ares Games! All participating players will receive an exclusive “Admiral Adama” promo card as a reminder of the event, as well as a limited-edition event promo card, a discount coupon to bring the ship you’ve battled in home, and additional prizes offered by Ares Games and by the co-sponsor of the campaign, Slitherine Software, publisher of the official videogame for PC and consoles Battlestar Galactica – Deadlock".